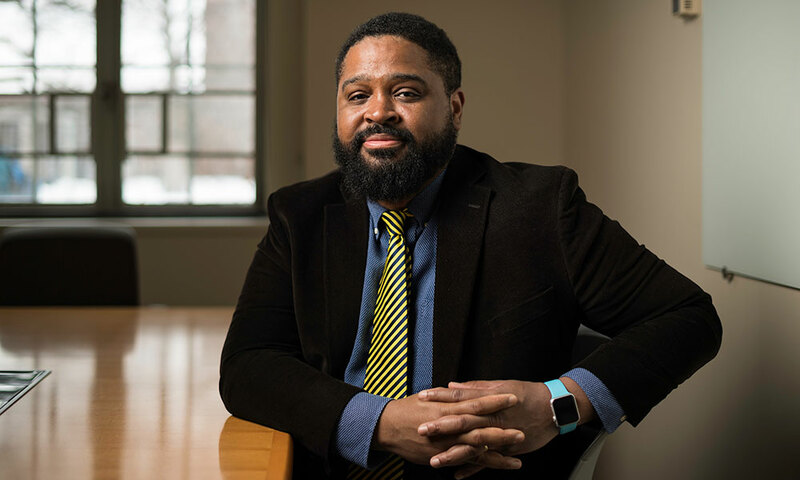 John Barker ‘09W (PhD) says his goals for higher education have always included three tenets: “access, equity, and social justice for all.” As of March 1, he is fulfilling those missions at Rochester in the newly created role as senior associate dean of the faculty for Arts, Sciences & Engineering. Barker, who most recently was dean of international education at Tufts University, served in various roles at Rochester earlier in his career. He worked in residential life and at the David T. Kearns Center from 2000 to 2007, where he was assistant director of the Ronald E. McNair Post-Baccalaureate Program. Reporting to interim dean of the faculty Rick Waugh, Barker will lead in the creation and implementation of programs to promote faculty professional development, particularly in the context of improving workplace culture. As faculty ombudsperson, he’ll provide resources for faculty related to climate, family-friendly policies, and career advancement. One of the first items on his agenda is to oversee a programmatic expansion of the Susan B. Anthony Institute for Gender, Sexuality, and Women’s Studies and the Frederick Douglass Institute for African and African-American Studies. He’ll also help to add faculty positions and eventually develop new programs and coursework that supports the University’s diversity and inclusion efforts. Waugh says Barker is the right person for this job. Barker, a Rochester native, lives in the suburb of Webster with his wife, Sarah, and children Owen, 8, and Nina, 6.